From our family to yours! We welcome you to try our handcrafted Mexican cuisine at any of our eight Arizona locations or Las Vegas location. We hope each visit is a family event, packed with flavor, tradition and delicious satisfaction. Fresh ingredients and food prepared every day in our kitchens, that’s what it’s all about. Our passion is community, food and you! We only use our own farm-grown chiles in our secret family recipes. Perfect for all your catering needs! We provide catering services to your home, office or any off-site location. Each menu is custom designed alongside the other services we provide, such as full décor or specialty rentals. 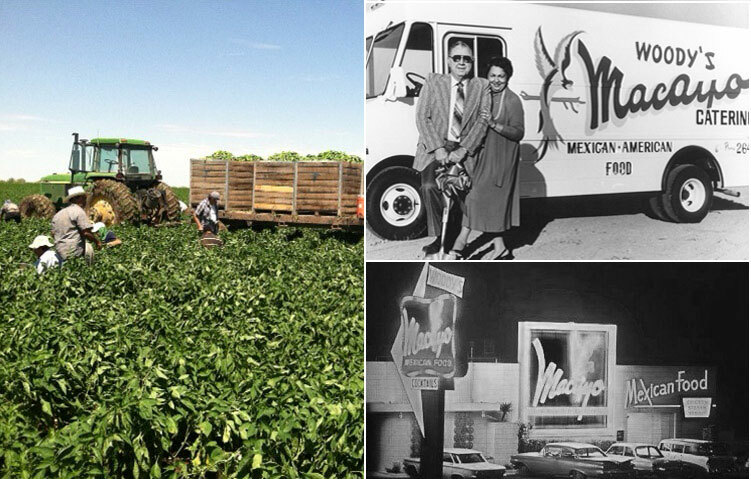 When Woody and Victoria Johnson opened their first restaurant in 1946, Woody’s El Nido, they began a legacy of quality food in a family atmosphere. Tradition is at the core of what we do. We believe in savory cuisine that does not compromise flavor or value. We believe in keeping the tradition alive through hospitality, quality ingredients and loyalty to our signature family recipes. Excellent service. I am on a Keto diet. I spoke with the waitress and between the both of us we figured out a chicken, steak, shrimp combination I could have that would be Keto friendly. Very kind of her, upbeat and friend. I was really impressed. We just may come back again before we leave. A special shout out to the waitress, also thanks to the cooks in the back. Many thanks for what you did! My boyfriend and I had dinner there this evening, I have always loved Macayo’s, I have been going there for years. The food was awesome, came hot, and fast. Our waiter was by far the best waiter I have ever had at ANY restaurant ever! He was very attentive, he refilled our drinks before they were empty, he was very nice, funny, sociable, very relaxed guy. He provided the perfect amount of attention for us to enjoy our meal! Came in around 4 pm, ordered off the Mex N Match menu. Excellent variety plate: I had a shredded beef taco, shredded chicken enchilada, black beans & rice, plus a margarita. Chips & salsa before the meal. All the items were well presented. Service was good - start to finish. Our server was friendly, knowledgeable of menu items & helpful. Food was prepared quickly & I never had to wait anywhere along the way. The restaurant was clean and I'll deserves the 5 stars!